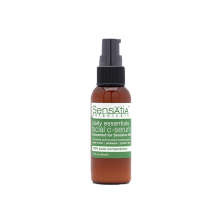 Daily essential c-serum packed with organic vitamin C from the Kakadu Plum. A light-yet-essential fragrance free concoction packed with pure botanicals of aloe vera, jojoba bean, seabuckthorn, rosehip, gotu kola, papaya, green tea & starfruit to help nourish & protect skin. The true star of the show is the USDA Organic, Wild Harvested Kakadu Plum Extract, an Australian superfruit containing the worlds richest source of vitamin C, (70x more than an orange.) Topically, vitamin C can help to reduce wrinkles & improve skin texture while brightening and improving skin elasticity. Water (Aqua), Aloe Barbadensis (Aloe) Leaf Juice, Cetearyl Glucoside & Sorbitan Olivate, Simmondsia Chinensis (Jojoba) Seed Oil, Terminalia Ferdinandiana Fruit Extract, Hippophae Rhamnoides (Seabuckthorn) Oil, Oenothera Biennis (Evening Primrose) Oil, Rosa Rubiginosa (Rosehip) Oil, Butyrospermum Parkii (Shea) Butter, Sodium Citrate, Argania Spinosa Kernel Oil, Tocopherol (Vitamin E), Citric Acid, Xanthomonas Campestris (Xanthan) Gum, Benzyl Alcohol & Benzoic Acid & Dehydroacetic Acid, Schizandra Chinensis Fruit Extract, Centella Asiatica (Gotu Kola) Extract, Carica Papaya (Papaya) Fruit Extract, Camellia Sinensis (Green Tea) Leaf Extract, Averrhoa Carambola (Star Fruit) Extract. After cleansing, while skin is still moist & supple; dispense 1-2 pumps of product into clean hands, massage into face. Store in cool, dry, place.